"Drain You" is a song by the American rock band, Nirvana, written by vocalist and guitarist Kurt Cobain. It is the eighth track on their second album, Nevermind, released in September, 1991. The same version also appears as a B-side on U.K. retail editions of the first single from that album, "Smells Like Teen Spirit". Originally titled "Formula," "Drain You" was written in 1990. The song was first recorded in the spring of 1991, when Cobain and Nirvana drummer Dave Grohl visited Melvins drummer Dale Crover and his then-girlfriend Debbi Shane in San Francisco, California, on their way to record what became Nevermind in Van Nuys. During their visit, the four recorded several songs on a four track, including "Drain You," under the band name, the Retards. "At the time, Kurt was into starting bands with everybody," Shane recalled, "so we went to the practice space my band Dumbhead shared with the Melvins, and formed the Retards for two days." According to Shane, the band worked on songs by all four members, with one person recording, and Cobain eventually "announced he had a song, which wasn't a Nirvana song because it didn't have a drum part. When Dale started playing drums, he was like, 'Wow, we have a drum part.'" The instrumental interlude was also developed during this session, which Shane says changed the song's character "from metal to a more Sonic Youth noise thing. With the song's structure now in place, the band brought it to the Nevermind recording sessions at Sound City Studios in May 1991. According to Nevermind's producer Butch Vig on the 2005 Classic Albums: Nirvana - Nevermind DVD, "Drain You" featured more guitar overdubs than any other song on the album: one clean track and five distorted tracks, two using a Mesa Boogie amp, two using a Fender Bassman amp, and one that they called the "Super grunge" track, using a pedal on the Fender Bassman. Due to Cobain's reluctance to record multiple takes, Vig claims he often had to trick Cobain by falsely claiming that certain parts were not recorded correctly or were out of tune, and needed to be recorded again. Cobain recorded three vocal takes, with all three takes being used throughout the recording. The sounds during the instrumental interlude were made by Cobain in a variety of ways, including using his squeaky mouse and rubber duck toys (the latter of which later appeared on the back cover of the band's 1992 compilation, Incesticide) that he brought into the studio. Sound engineer Andy Wallace added delay to these sounds to complete the effect. In the 1993 Nirvana biography Come As You Are: The Story of Nirvana, Michael Azerrad described "Drain You" as "a love song, or rather a song about love," in which the babies in the lyrics "represent two people reduced to a state of perfect innocence by their love." Cobain told Azerrad that the lyrics made him think of "two brat kids who are in the same hospital bed." The song's imagery predicted the medical themes that would feature heavily in the lyrics of Nirvana's following album, In Utero. In the 2001 Cobain biography Heavier Than Heaven, Charles Cross wrote that Cobain claimed to have made up most of the song's lyrics on the spot, but pointed out that the line, "'One baby to another says I'm lucky to have met you'"... was particularly important to the interpretation of the song..."
Cobain expressed fondness for the song, telling David Fricke in a 1993 Rolling Stone interview that he thought it was as good, if not better, than the band's biggest hit, "Smells Like Teen Spirit." I love the lyrics, and I never get tired of playing it," he said. "Maybe if it was as big as 'Teen Spirit, I wouldn’t like it as much." A live version, recorded on December 28, 1991 at Del Mar Fairgrounds in Del Mar, California, was released as the second promotional single from the live compilation From the Muddy Banks of the Wishkah in 1996. This version was the 11th most played song of 1997 on Boston's WBCN (FM). The version from the Nevermind album appears in the video games Rock Band 2 and Rock Band Unplugged. 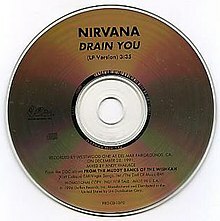 In 2017, to mark what would have been Kurt Cobain's 50th birthday, the Phonographic Performance Limited released a list of the top 20 most played Nirvana songs on TV and radio in the U.K., and "Drain You" was number 11. ^ "This Day in Music Spotlight: Nirvana Begins Recording 'Nevermind'". .gibson.com. Retrieved May 6, 2016. ^ Cross, Charles R. (August 15, 2001). Heavier Than Heaven. United States: Hyperion. p. 163. ISBN 0-7868-6505-9. ^ Gaar, Gillian G. (2009). The Rough Guide to Nirvana. Penguin. p. 194–195. ISBN 978-1-4053-8119-2. ^ True, Everett (March 13, 2007). Nirvana: The Biography. Da Capo Press. ISBN 0306815540. ^ Cross, Charles; Berkenstadt, Jim (February 22, 2012). Classic Rock Albums: Nirvana - Nevermind. New York City: Schirmer Trade Books. ISBN 9780857127686. ^ St. Thomas. pp. 107. ^ Gaar, Gillian G. (2009). The Rough Guide to Nirvana. Penguin. ISBN 978-1-4053-8119-2. ^ Azerrad, Michael (1994). Come As You Are: The Story of Nirvana. Doubleday. p. 219. ISBN 0-385-47199-8. ^ Garr, Gillian G. (2006). In Utero. United States: Continium. p. 219. ISBN 0-8264-1776-0. ^ Cross, Charles R. Heavier than Heaven. Pg 233. ^ a b Fricke, David (27 January 1994). "Kurt Cobain: The Rolling Stone Interview | Music News". Rolling Stone. p. 3. Retrieved 23 August 2018. ^ "Billboard Airplay Monitor" (PDF). Billboard (Airplay Monitor edition). Billboard. December 26, 1997. Retrieved August 18, 2018. ^ "Alternative Top 50" (PDF). Radio & Records. Radio & Records. December 20, 1996. p. 84. Retrieved February 20, 2019. This page was last edited on 20 March 2019, at 10:16 (UTC).